Yeah, so, I’ve just had diner, which was a simply scrumptious affair of pie, mash and sweet corn, followed by coconut yoghurt for pud. Today I’ve been in a much more positive frame of mind, and though I’m still taunting myself with artificial deadlines I’m doing it with wry good humour. Add that I’m happy with what I’ve written and it’s no wonder the cat is purring. What I haven’t done on day four is write as much as I should have. I’m going to be a tad behind going in to day five, but not so much that catching up isn’t doable. Blimey, the English language is wonderfully rich and infinitely malleable, isn’t it? Maybe, for clarity, I should have said: I’ll be behind on day five, but I can catch up. I love it! There are so many different ways to couch a thought. Actually, that’s a very good point…. Note to self: NaNoWriMo is all about the 50,000 words. Write, write and write! Do not carefully construct each and every sentence while writing or, unless your name is Stephen Fry, you won’t get to 50,000 words. Re-writing comes in December, and then is the time to tweak, primp and tartify your prose. Dear god, let this be a mistake! Though I have yet to go to an actual race, and I’m disparagingly called an ‘armchair fan,’ there’s no doubt I love Formula One. It’s wicked and splendid and wonderful and I’ll argue until the cows come home for my right to watch it. 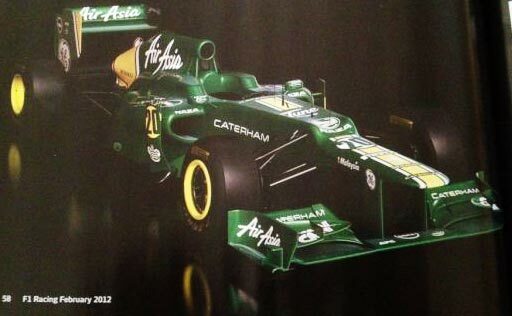 However, this just released picture of the 2012 Caterham CT01 is making my hard on for the sport wilt. Fast. I don’t think I’ve ever seen anything with less beautiful lines in my life. Once upon a time I had a Skoda, and it was gorgeous in comparison. Whatever the rules are that meant a designer had to design the car above need to be changed. Now, if not sooner. Now, before I (and a lot of other F1 fans with eyesight) give up F1 for International Tiddlywinks. Please? Pretty please with bells on?